The history of Soviet Russia and the Soviet Union reflects a period of change for both Russia and the world. Though the terms Soviet Russia and Soviet Union are synonymous in everyday vocabulary, Soviet Russia, in the context of the foundation of the Soviet Union, refers to the few years after the abdication of the crown of the Russian Empire by Tsar Nicholas II (in 1917), but before the creation of the Soviet Union in 1922. Early in its conception, the Soviet Union strived to achieve harmony among all people of all countries. The original ideology of the state was primarily based on the works of Karl Marx and Friedrich Engels. In its essence, Marx's theory stated that economic and political systems went through an inevitable revolution based upon class struggle, by which the current capitalist system would be destroyed or abolished before achieving international cooperation and peace in a "Workers' Paradise," creating a system directed by what Marx called "Pure Communism." Marx favoured abolishment of the bourgeois state and to establish a new state, however not a copy of the old. A state is not supposed to exist forever and defend development of new class structures. The aim was to create a system with an internal logic and direction based upon spreading the class-struggle worldwide simply because the working class and working population just as the capitalist mode of production is international. Engels at first agreed with the aim to abolish the bourgeois state – but later in London 6 of March 1895 in the introduction to Marx' book 'Class struggle in France 1848–1850' he dismissed the idea of revolution. Engels instead favoured to reach socialism through elections in the capitalist parliaments and not in socialist revolution confronting the capitalist state. Marx was used the phrase 'the dictatorship of the proletariat' and many believe that he was promoting a pure dictatorship. That is not correct if we look upon his late article 'The Paris Commune' which is the opposite of the system seen in the Socialist Federation of the Bolshevik party which step by step from the end of 1917 actually abolished free elections to the councils (soviets) by appointment from above. Displeased by the relatively few changes made by the Tsar after the 1905 Russian Revolution, Russia became a hotbed of anarchism, socialism and other radical political systems. The dominant socialist party, the Russian Social Democratic Labour Party (RSDLP), subscribed to Marxist ideology. Starting in 1903, a series of splits in the party between two main leaders was escalating: the Bolsheviks (meaning "majority") led by Vladimir Lenin, and the Mensheviks (meaning "minority") led by Julius Martov. Up until 1912, both groups continued to stay united under the name "RSDLP," but significant and irreconcilable differences between Lenin and Martov led the party to eventually split. A struggle for political dominance subsequently began between the Mensheviks and the Bolsheviks. Not only did these groups fight with each other, but they also had common enemies, notably, those trying to bring the Tsar back to power. Following the February Revolution in 1917, the Mensheviks gained control of Russia and established a provisional government, but this lasted only until the Bolsheviks took power in the October Revolution (also called the Bolshevik Revolution) later in the year. To distinguish themselves from other socialist parties, the Bolshevik party was renamed the Russian Communist Party (RCP). Under the control of the party, all politics and attitudes that were not strictly RCP were suppressed, under the premise that the RCP represented the proletariat and all activities contrary to the party's beliefs were "counterrevolutionary" or "anti-socialist." During the years between 1917 and 1923, the Soviet Union achieved peace with the Central Powers, their enemies in World War I, but also fought the Russian Civil War against the White Army and foreign armies from the United States, the United Kingdom, and France, among others. This resulted in large territorial changes, albeit temporarily for some of these. Eventually crushing all opponents, the RCP spread Soviet style rule quickly and established itself through all of Russia. Following Lenin's death in 1924, Joseph Stalin, General Secretary of the RCP, became the de facto leader of the USSR. During World War I, Tsarist Russia experienced famine and economic collapse. The demoralized Russian Army suffered severe military setbacks, and many captured soldiers deserted the front lines. Dissatisfaction with the monarchy and its policy of continuing the war grew among the Russian people. Tsar Nicholas II abdicated the throne following the February Revolution of 1917 (March 1917 N.S. See: Soviet calendar. ), causing widespread rioting in Petrograd and other major Russian cities. The Russian Provisional Government was installed immediately following the fall of the Tsar by the Provisional Committee of the State Duma in early March 1917 and received conditional support of the Mensheviks. Led first by Prince Georgy Lvov, then Alexander Kerensky the Provisional Government consisted mainly of the parliamentarians most recently elected to the State Duma of the Russian Empire, which had been overthrown alongside Tsar Nicholas II. The new Provisional Government maintained its commitment to the war, joining the Triple Entente which the Bolsheviks opposed. The Provisional Government also postponed the land reforms demanded by the Bolsheviks. Lenin, embodying the Bolshevik ideology, viewed alliance with the capitalist countries of Western Europe and the United States as involuntary servitude of the proletariat, who was forced to fight the imperialists' war. As seen by Lenin, Russia was reverting to the rule of the Tsar, and it was the job of Marxist revolutionaries, who truly represented socialism and the proletariat, to oppose such counter-socialistic ideas and support socialist revolutions in other countries. Within the military, mutiny and desertion were pervasive among conscripts, though being AWOL (Absent Without Leave) was not uncommon throughout all ranks. The intelligentsia was dissatisfied over the slow pace of social reforms; poverty was worsening, income disparities and inequality were becoming out of control while the Provisional Government grew increasingly autocratic and inefficient. The government appeared to be on the verge of succumbing to a military junta. Deserting soldiers returned to the cities and gave their weapons to angry, and extremely hostile, socialist factory workers. The deplorable and inhumane poverty and starvation of major Russian centers produced optimum conditions for revolutionaries. 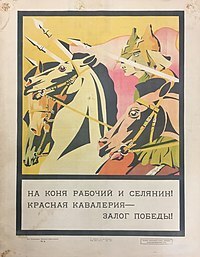 Failed military offensives in summer 1917 and large scale protesting and riots in major Russian cities (as advocated by Lenin in his Theses, known as the July Days) led to the deployment of troops in late August to restore order. The July Days were suppressed and blamed on the Bolsheviks, forcing Lenin into hiding. Still, rather than use force, many of the deployed soldiers and military personnel joined the rioters, disgracing the government and military at-large. It was during this time that support for the Bolsheviks grew and another of its leading figures, Leon Trotsky, was elected chair of the Petrograd Soviet, which had complete control over the defenses of the city, mainly, the city's military force. On 24 October, in early days of the October Revolution, the Provisional Government moved against the Bolsheviks, arresting activists and destroying pro-Communist propaganda. The Bolsheviks were able to portray this as an attack against the People's Soviet and garnered support for the Red Guard of Petrograd to take over the Provisional Government. The administrative offices and government buildings were taken with little opposition or bloodshed. The generally accepted end of this transitional revolutionary period, which will lead to the creation of the Union of Soviet Socialist Republics (USSR) lies with the assault and capture of the poorly defended Winter Palace (the traditional home and symbol of power of the Tsar) on the evening of 26 October 1917. The Mensheviks and the right-wing of the Socialist Revolutionaries, outraged by the abusive and coercive acts carried out by the Red Guard and Bolsheviks, fled Petrograd, leaving control in the hands of the Bolsheviks and remaining Left Socialist Revolutionaries. On 25 October 1917, the Sovnarkom was established by the Russian Constitution of 1918 as the administrative arm of the All-Russian Congress of Soviets. By 6 January 1918, the VTsIK, supported by the Bolsheviks, ratified the dissolution of the Russian Constituent Assembly, which intended to establish the non-Bolshevik Russian Democratic Federative Republic as the permanent form of government established at its Petrograd session held 5 and 6 January 1918. At the third meeting of the All-Russian Congress of Soviets on 25 January 1918, the unrecognised state was renamed the Russian Soviet Republic. The frontiers between Poland,which had established an unstable independent government following World War I,and the former Tsarist empire,were rendered chaotic by the repercussions of the Russian revolutions,the civil war and the winding down World War I. Poland's Józef Piłsudski envisioned a new federation (Międzymorze),forming a Polish-led East European bloc to form a bulwark against Russia and Germany,while the Russian SFSR considered carrying the revolution westward by force. When Piłsudski carried out a military thrust into Ukraine in 1920,he was met by a Red Army offensive that drove into Polish territory almost to Warsaw. However, Piłsudski halted the Soviet advance at the Battle of Warsaw and resumed the offensive. The "Peace of Riga" signed in early 1921 split the territory of Belarus and Ukraine between Poland and Soviet Russia. On 29 December 1922 a conference of plenipotentiary delegations from the Russian SFSR, the Transcaucasian SFSR, the Ukrainian SSR and the Byelorussian SSR approved the Treaty on the Creation of the USSR and the Declaration of the Creation of the USSR, forming the Union of Soviet Socialist Republics. These two documents were confirmed by the 1st Congress of Soviets of the USSR and signed by heads of delegations – Mikhail Kalinin, Mikhail Tskhakaya, Mikhail Frunze and Grigory Petrovsky, Alexander Chervyakov respectively on 30 December 1922. During the Civil War (1917–21), the Bolsheviks adopted War communism, which entailed the breakup of the landed estates and the forcible seizure of agricultural surpluses. In the cities there were intense food shortages and a breakdown in the money system (at the time many Bolsheviks argued that ending money's role as a transmitter of "value" was a sign of the rapidly approaching communist epoch). Many city dwellers fled to the countryside – often to tend the land that the Bolshevik breakup of the landed estates had transferred to the peasants. Even small scale "capitalist" production was suppressed. In the cities and between the cities and the countryside, the NEP period saw a huge expansion of trade in the hands of full-time merchants – who were typically denounced as "speculators" by the leftists and also often resented by the public. The growth in trade, though, did generally coincide with rising living standards in both the city and the countryside (around 80% of Soviet citizens were in the countryside at this point). ^ Mccauley, Martin (2013). Stalin and Stalinism: Revised 3rd Edition. Seminar Studies. Routledge. ISBN 9781317863687. How the October revolution was betrayed with a party-state and party dictatorship that sidelined the soviets (councils) and where the highest party- and state-elite themselves established ownership of the means of productions including the economic surplus. Democratic soviets/councils or party-dictatorship. This page was last edited on 2 April 2019, at 03:13 (UTC).